Destin, FL – Wear it and forget it’s there. That’s the overwhelming consensus from anglers who have already slipped a new face-protecting garment under their hats. Fish Monkey, renowned for the “second skin fit” of its high-grade fishing gloves, recently released its equally comfortable Performance Face Guard. Concepted, crafted and tailored to the same exacting, angler-friendly standards as its popular Guide Series gloves, Fish Monkey’s Face Guard lightly cools the skin, while wrapping your face and neck in total sun-protection. Surprisingly light, comfortable and functional, Fish Monkey Performance Face Guards utilize an advanced feather-weight polyester-spandex material, yielding all-day comfort and a perfect, non- burdening fit. Special 4-Way Stretch construction keeps the Guard firmly in place without slipping, while extra stitching in key areas gently hug each facial contour—neck to nose. The lightly fitted Face Guard also sports a flared-out bottom, providing total, unrestricted neck coverage, front and back. Featuring Fish Monkey’s superior UPF 50+ Sun Protection Technology, the feather-light Face Guard material also keeps the angler’s skin cool and comfortable under the hottest sun. The super-breathable fabric offers a cooling effect, while an integrated laser-cut mouth pattern helps prevent sunglass fogging. 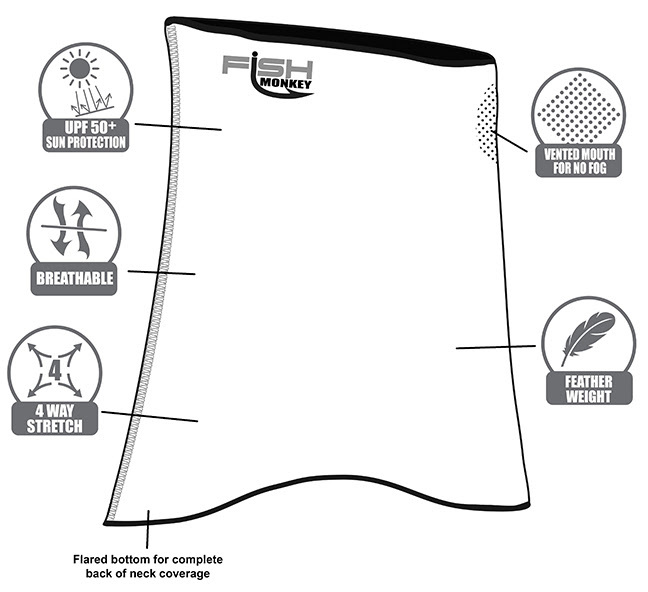 Fish Monkey’s new Face Guard defends your entire façade, keeping you cool, comfortable and fully protected from the sun. Available at outdoor retailers everywhere, the Fish Monkey Performance Face Guard (MSRP $22.95) flaunts fourteen radical colors, including new Voodoo Swamp patterns, individualized to put your best face forward.